SSG Clinton Romesha also received a Medal of Honor for that small but determined battle last February. 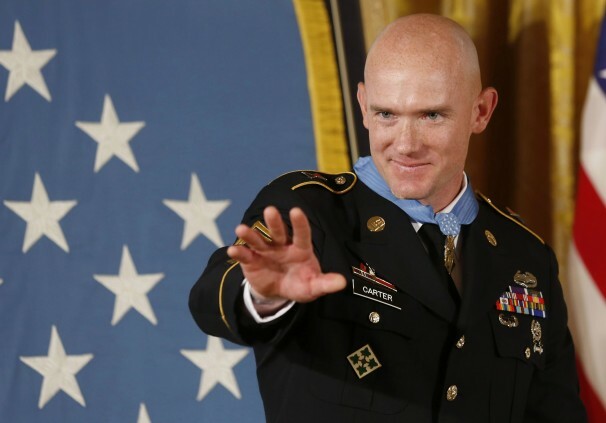 This marks the first time that two American fighting men have received the MoH for the same action since Special Forces SFC Randall Shugart and MSG Gary Gordon sacrificed themselves defending the site of one of the downed helicopters in Mogadishu, Somalia in 1993, later popularized in the book and movie Black Hawk Down, coincidentally occurring on the same date. This is the first time that two survivors have received the MoH since Sgt Leonard Keller and Sp4 Raymond Wright of the 60th Infantry, 9th Infantry Division, together assaulted and eliminated a series of Viet Cong bunkers in May 1967. Then-Specialist Carter distinguished himself by dashing through heavy enemy fire several times to bring ammo and supplies to a group of soldiers who had been pinned down in an armored Humvee in a battle position on the south side of the camp, only to find himself finally pinned there as well when the incoming fire became even heavier. The .50-calibre atop the vehicle had become disabled by an RPG round, one of several that struck the vehicle and sprayed shrapnel that wounded Carter and several others, and the troops were soon exhausting their ammunition. Their position was clearly untenable and another attempt by SGT Josh Hardt and two others in another Humvee to rescue them resulted in Hardt and SPC Chris Griffin being cut down and killed. The armor on the Humvee that held the trapped men was beginning to be compromised, with rounds starting to enter the cramped compartment. SGT Justin Gallegos and SPC Stephen Mace tried to make a break to link up with the command post, the small Tactical Operations Center (TOC), while Carter and the others provided covering fire, but Gallegos was killed in the attempt and Mace gravely wounded before they had gone no more than a few steps. Mace, understandably, began calling for help. Enemy fire was raining in on them from around the surrounded camp, and now the insurgents had breached the compound and were maneuvering inside the wire. Carter realized that he had no real choice, so dashed to the aid of Mace and delivered basic first aid as best he could, lying beside the dead Gallegos. Miraculously, the enemy rate of fire did not bear down on them during those minutes as intensely, and Carter was further unharmed as he drug Mace to some minor form of shelter next to the Humvee. Carter then ran to retrieve Gallegos' radio and called for help from the besieged command post where Lieutenant Bundermann was trying to run the defense. For the first time, both locations found that each other were alive and still active. 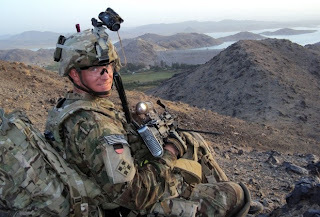 The other locations then poured fire at the enemy positions to provide cover for Carter, along with SGT (now 1LT) Brad Larson, to carry Mace to the aid station while still engaging the enemy with their M4 carbines, killing two and wounding one. Carter continued to be actively engaged alongside his troops, including two Latvian advisors to the Afghan troops, until the battle concluded that night with the assistance of reinforcements and air cover. During the battle, he took the time to grab a chainsaw and cut down a burning tree, all the while still under fire, that was threatening to consume the aid station. Eight soldiers ended up killed in the battle including, eventually, SPC Mace. But 45 survived and the position held. The Army command, which had already considered the camp to be vulnerable, soon had it evacuated and destroyed. An investigation followed the incident as to why the troops had remained so exposed and vulnerable, at the bottom of a steep valley and alongside a confluence of two rivers, similar to the earlier Battle of Wanat nearby and some fifteen months before. The White House ceremony is expected to take place on 26 August. In an interview with the Military Times after the announcement, Carter said, "It wasn't just me; everyone pulled through. They all performed excellently, bravely. I really wish there was some way that I could share the prestige and the honor of this medal with them, not to mention the families of the fallen." Carter expressed deep regret to the mother of SPC Mace: "That was one of the harder parts, telling Mace's mother that I'm sorry I didn't get to him in time." Both Bundermann and Larson, as well as at least six others, received the Silver Star for their actions that day. Carter also received the Purple Heart for wounds sustained, including shrapnel wounds, a concussion and hearing loss in his left ear. Carter admits to being badly shaken by the battle and credits the help he received from his fellow soldiers and counselors who assisted him in his indisputable case of PTS. As for the idea of two Medals of Honor for the same action, we still await the result of the recommendation for Army Captain Will Swenson, aided by a Congressional inquiry, and his actions alongside Sergeant Dakota Meyer, USMC, at the Battle of Ganjgal at about the same time. Update: The Army has published an official announcement. "Specialist Ty M. Carter distinguished himself by acts of gallantry and intrepidity at the risk of his life above and beyond the call of duty while serving as a Scout with Bravo Troop, 3d Squadron, 61st Cavalry Regiment, 4th Brigade Combat Team, 4th Infantry Division, during combat operations against an armed enemy in Kamdesh District, Nuristan Province, Afghanistan on October 3, 2009. On that morning, Specialist Carter and his comrades awakened to an attack of an estimated 300 enemy fighters occupying the high ground on all four sides of Combat Outpost Keating, employing concentrated fire from recoilless rifles, rocket propelled grenades, anti-aircraft machine guns, mortars and small arms fire. Specialist Carter reinforced a forward battle position, ran twice through a 100 meter gauntlet of enemy fire to resupply ammunition and voluntarily remained there to defend the isolated position. Armed with only an M4 carbine rifle, Specialist Carter placed accurate, deadly fire on the enemy, beating back the assault force and preventing the position from being overrun, over the course of several hours. With complete disregard for his own safety and in spite of his own wounds, he ran through a hail of enemy rocket propelled grenade and machine gun fire to rescue a critically wounded comrade who had been pinned down in an exposed position. Specialist Carter rendered life extending first aid and carried the Soldier to cover. 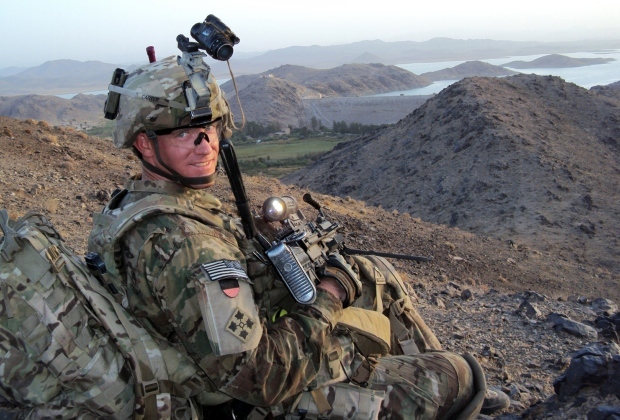 On his own initiative, Specialist Carter again maneuvered through enemy fire to check on a fallen Soldier and recovered the squad’s radio, which allowed them to coordinate their evacuation with fellow Soldiers. With teammates providing covering fire, Specialist Carter assisted in moving the wounded Soldier 100 meters through withering enemy fire to the aid station and before returning to the fight. Specialist Carter’s heroic actions and tactical skill were critical to the defense of Combat Outpost Keating, preventing the enemy from capturing the position and saving the lives of his fellow Soldiers. Specialist Ty M. Carter’s extraordinary heroism and selflessness above and beyond the call of duty are in keeping with the highest traditions of military service and reflect great credit upon himself, Bravo Troop, 3d Squadron, 61st Cavalry Regiment, 4th Brigade Combat Team, 4th Infantry Division and the United States Army." Thanks for the good summary. Much better than the Army's boilerplate. It's only a pity that their valor is wasted fighting for a policy conjured by a president with no integrity, much less valor. As for your observation about 'wasted valor', I'm always reminded of the waning days of the Viet Nam War, when our troops were essentially fighting so that the striped-pants crowd could dither endlessly -- which is what the NV wanted -- so that the shape of the negotiating table in Paris could be debated. The Iranians are doing likewise, talking us to death while they do precisely what they want, while laughing at us in their press for being so gullible. The Unknown "Star Spangled Banner"